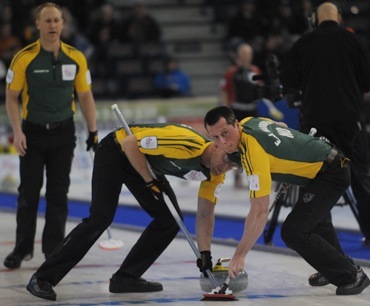 EDMONTON — Brad Jacobs of Northern Ontario and Quebec’s Jean-Michel Ménard scored impressive victories Sunday morning to improve to 2-0 and a share of first place after three draws in the Tim Hortons Brier, presented by Monsanto. 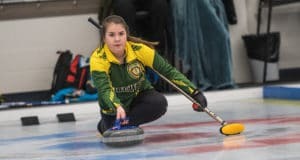 Jacobs capitalized on misses by British Columbia’s Andrew Bilesky to roll to a 9-3 win in seven ends while Ménard took advantage of shaky shooting by Kevin Martin to score two in the second end and three in the ninth to beat Alberta 8-4. 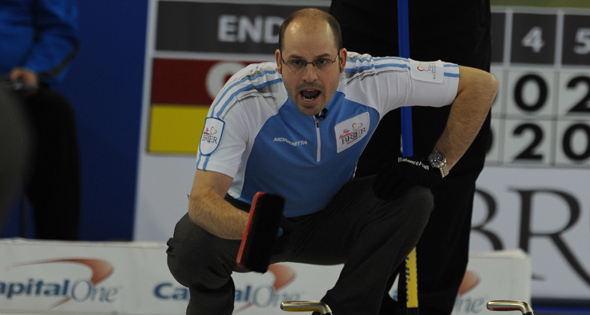 In other Draw 3 games, Manitoba’s Jeff Stoughton had big ends early and late to beat Paul Flemming of Nova Scotia 9-4, and defending champion Glenn Howard of Ontario drew the button with last rock to get past Brock Virtue of Saskatchewan 7-5. After three draws, Quebec, Northern Ontario, Newfoundland-Labrador, Manitoba and Ontario are 2-0; Saskatchewan and Northwest Territories/Yukon are 1-1 while Alberta, British Columbia, New Brunswick, Nova Scotia and Prince Edward Island are 0-2. Bilesky and Jacobs traded singles in the first and second ends before Northern Ontario stole three in the third, then scored two in the fifth and stole three more in the sixth. “The three in the third end, could probably say that was a big turning point. We would get more confidence for the rest of the game and they kind of went the other way,” said Jacobs. “On my last one we called it perfect, swept it perfect and we put him in a tough spot. He had to go out wide into a new path for his one and it over curled, was light. 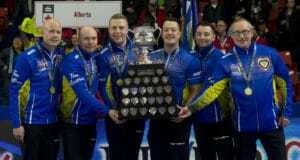 Ménard had Martin, seeking a record fifth Brier championship as a skip, on the defensive from the opening end as the Alberta foursome struggled with its shots while the Quebec foursome was sharp throughout the match. It began early, in the second end when Martin was way short on a freeze attempt, failing to even reach the rings, leaving Ménard an easy draw for two. The Quebec skip said they knew from there the Alberta rink wasn’t sharp. Stoughton scored three in the first end and had Flemming on the defensive the rest of the game. Third Ian Fitzner-LeBlanc, throwing last stones for the Maritimers, found himself constantly facing difficult shots. Like in the sixth end when he was facing four Manitoba counters with his last rock. He made the successful hit and stick for a single to keep Nova Scotia alive. But after Flemming stole two in the seventh to pull within a single of Manitoba, Stoughton made a double takeout with his final rock to score four in the eighth for the victory. In contrast to Saturday’s second draw when he fell behind 3-0 after two ends, on Sunday Howard scored a deuce in the first, sneaking past a tight guard to draw the four foot. He had Saskatchewan staring at five Ontario counters in the second but skip Brock Virtue calmly drew the edge of the button for a single. Saskatchewan pulled even in the fourth when Howard was a little heavy with his last rock draw, letting Virtue steal a single. Ontario came back with a single in the fifth, a steal of one in the sixth and after the teams traded deuces in the eighth and ninth, Howard calmly drew the button with last rock in the 10th for the win. There are two more draws today, at 1:30 p.m. and 6:30 p.m. MST (TSN-RDS). In Draw 4 it will be James Grattan of New Brunswick meeting Nova Scotia, Saskatchewan versus Brad Gushue of Newfoundland-Labrador, Northern Ontario against Eddie MacKenzie of Prince Edward Island and Jean-Michel Ménard of Quebec versus Jamie Koe of Northwest Territories/Yukon. 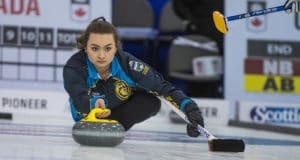 For updated scores and standings go to www.curling.ca. 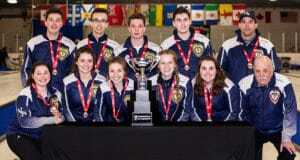 Under-18 Curling Canada Championships begin Tuesday in Sherwood Park, Alta.